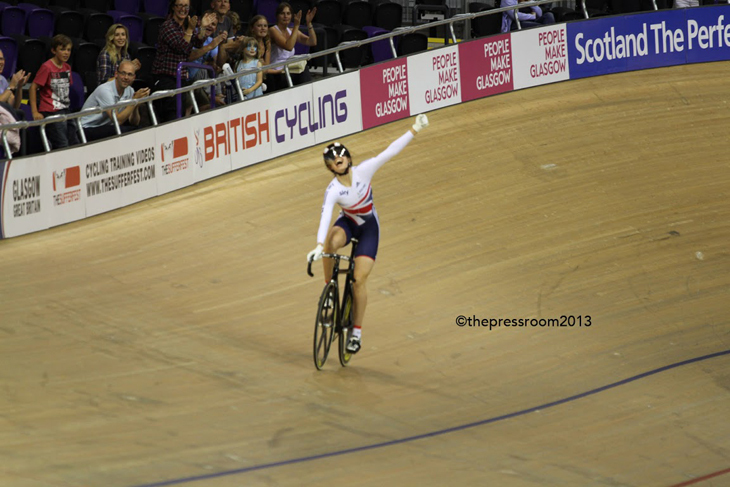 Last weekend saw the cream of the World’s junior track talents come together at the Sir Chris Hoy Velodrome in Glasgow and from that meet several names emerged that we’re sure to see more of in the future. Walking through the car park it was interesting to see some of the vehicles from the countries that had travelled from the near continent. There were panel vans, motorhomes, trucks and minibuses and while some had spent more money than others they’d all made their way to the new track cycling mecca in Glasgow (we especially liked the way the Kiwis had customised their hire van with blacking masking tape to show their national flag). Walking around the in-field, and looking at the array of equipment on show, it soon became clear that whatever the respective budgets everybody was here to win. A four-day competition is a big ask for spectators who have to juggle working lives and home lives alongside the desire to watch quality track action and some of the morning sessions could have been busier. That said, the two nights that we were there, Saturday and Sunday, saw enthusiastic crowds of fans mixed in with the usual sprinkling of riders’ family members. Certainly enough to provide a really nice atmosphere. The stars of Saturday night came from a variety of countries with the first winner being Arianna Fidanza of Italy who took the women’s Points race ahead of Elissa Wundersitz of Australia with an excellent third spot going to Britain’s Hayley Jones. The new World Junior Champion only just managed to keep her composure during the national anthem and this display of emotion is something, which we often miss, in the senior events. We then had on-track action with the culmination of the men’s Omnium where Jack Edwards of Australia took the overall honours ahead of Germany’s Marc Jurczyk and Denmark’s Casper Phillip Pedersen. Edwards was in demand after the ceremony as he appears to have the beginnings of a fan club hunting for his autograph and photo. The outstanding performance of Saturday night, as far as the partisan home crowd was concerned, was undoubtedly the girl from Solihull, Dannielle Khan. She emerged victorious in the women’s sprint final to take the title from Nicky Degrendele of Belgium and France’s Melissandre Pain and her performance prompted UCI man-of-the-moment Brian Cookson to tell this reporter that we better get used to seeing her on the top step of the podium. Sunday’s action was no less exciting with the culmination of the men’s Sprint that eventually went toLithuania’s Svajunas Jonauskas. This rider showed great maturity, and a sporting instinct, when his opponent Patrick Constable crashed heavily in the heats. Rather than just head back to the in-field he stopped on-track next time around to make sure that the Aussie was not too badly hurt. Unfortunately Constable was unable to continue but we were still treated to a thrilling sprint final between Jonauskas and Jeremy Presbury of New Zealand with the Kiwi taking the first heat but losing out in the next two. 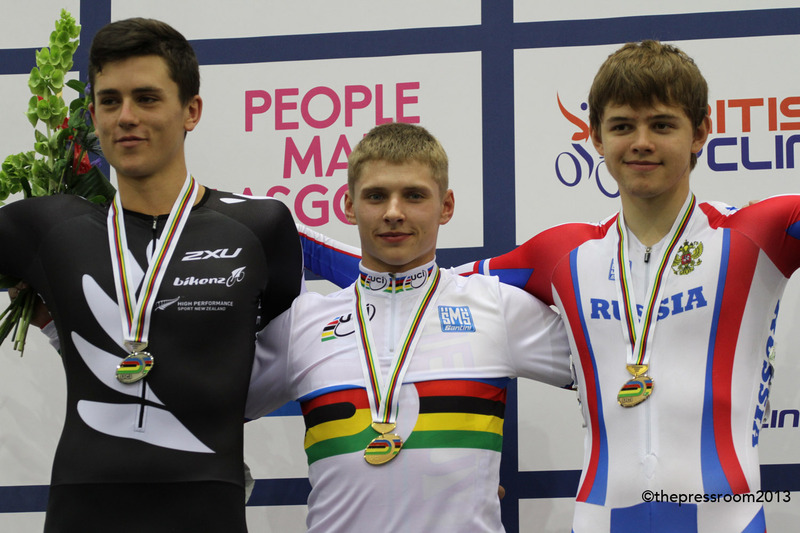 The young Lithuanian is a very popular winner if the number of ‘likes’ on our Facebook page can be taken as a guide. 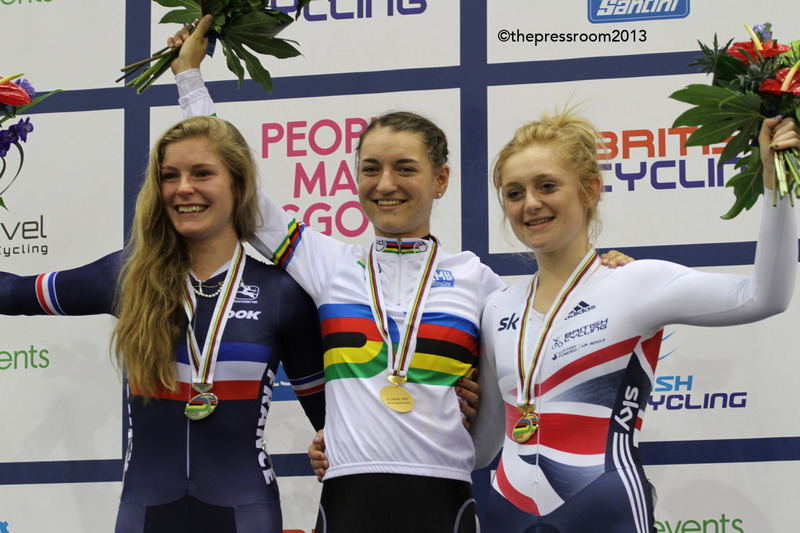 Next up was the culmination of the women’s Omnium with the 500m Time Trial and we saw a superfast time by Britain’s Emily Kay which was the best time up to that point. However, it was bettered by eventual overall winner Anna Knauer of Germany and France’s Soline Lamboley who took Gold and Silver. We then had the excitement of the women’s Keirin where France’s Melissandre Pain proved superior to Britain’s Danni Khan and Korea’s Kim Soojin and was really over the moon to take the World’s jersey. All that was left was the madness of the men’s Madison and as incomprehensible as this race can often be it quickly became clear that nobody was going to beat the Danes. They proved to be popular winners with the Kiwis and Aussies taking Silver and Bronze. As soon as it was over, everybody was packing up and heading home. Vans were being loaded in the car-park and excited teenagers were getting ready to make their way home…but not without a few celebrations first. 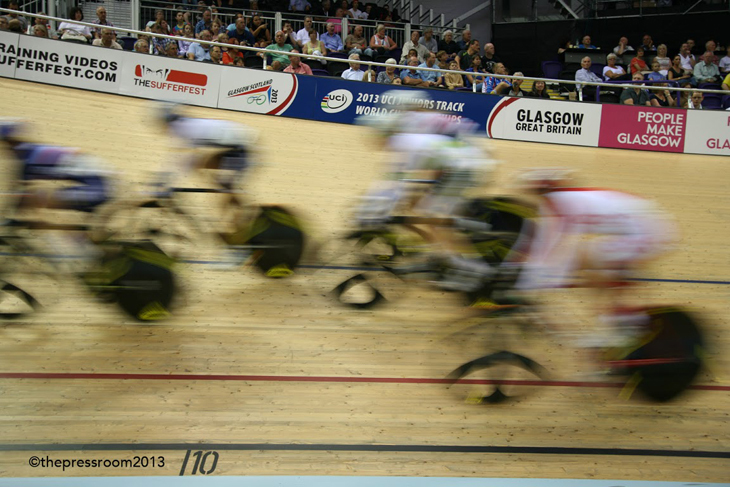 Glasgow is now officially the busiest velodrome in Europe and it will only get busier as the Commonwealth Games get closer. If the Junior World’s was anything to go by then the track events at the Games are not to be missed as the action will be both fast and furious.